In our previous posts we talked about the design process and then different kinds of systems to choose from. Now let's talk about the system components that you need to be aware of before tackling a project like this. Many people believe that you just get some panels and wire them into the electrical system. It's not quite that simple. A typical grid-tie solar power system. Of course the most obvious part of the system is the panel. But there are several types of panels to consider. Crystalline panels: these are the blue-ish black solar panels that are encased in aluminum and tempered glass to protect them from weather. These are the most common panels and generally the easiest to find. Their advantage is that they can be mounted to nearly any surface and they have the highest efficiency. Solar film: these cells look more like rolls of roofing materials than photovoltaic materials. This is probably the future of solar as these are much cheaper to produce. Currently the only solar film that isavailable has to be stuck to a metal roof. This will definitely change in the coming months and years as this technology advances. Solar power makes direct current, or DC power, and your home uses alternating current, or AC, power. An inverter can turn steady stream DC power into wavy AC power. There are several different kinds of inverters and they differ in the kind of wave they create. Modified sine wave inverters: create current that resembles connected up and down stair cases, as the inverter creates steps in the current. Pure sine wave inverters: these inverters create a nice even up and down sine wave. Micro inverters: this is a new development where each panel has its own inverter. This helps in several ways. First it means that you can have a far smaller system to start with since you could wire one panel and one micro inverter and tie into the grid. All other grid-tie inverters require a higher voltage and need at least 1000 watts (or 4 to 8 panels) to work properly. Secondly inverting at the panel means you can use small gauge wire (instead of large diameter wire that DC requires) from the panel to the main power panel, saving money on wire cost. Sensitive electronics, like entertainment equipment, require a pure wave to operate properly, while smaller electronics, like small kitchen appliances, work just fine with modified wave. Pure sine wave is more expensive but it recommended since we have so many advanced-technology electronics in the home these days like computers, plasma televisions, and stereo equipment. Whenever batteries are present in a solar power system, a charge controller is needed. 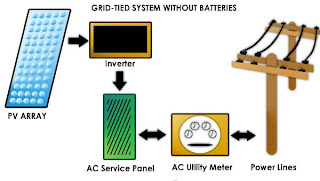 Most grid-tied system won't have batteries and therefore won't have a charge controller. Controller's are needed because, unlike other power sources that have an off and on switch, solar panels are pretty much 'on' as long as the sun is shining. This can be a problem if the batteries are at full capacity as overcharging them would ruin them. So the charge controller controls how much charge goes into the batteries. 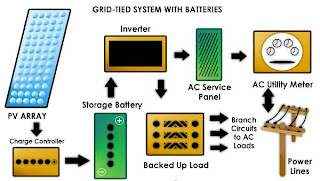 A typical battery-backup grid tie system. Most controllers are now Multi-Point Power Tracking, or MPPT, units. This a fancy way of saying that the controller optimizes the amperage and voltage in the system to recover the maximum wattage. This is becoming a standard feature and you should not consider a non-MPPT controller. Next week we'll talk about system and component costs. Great article. The price of oil and natural gas are going to continue to rise making solar even more of an option. The price of panels is down over 30% and the incentives the government offers makes it even more affordable. Alot of entrepreneurs are taking advantage of this permanent shift and starting different solar businesses such as an installation business or solar sales business.